Life is a journey. Spiritual evolution is a spiral. Living a conscious life puts you in the driver's seat of your own magnificently spiraling journey. Christine Agro We've been asleep at the wheel of our lives and the time is now to wake-up and start steering! In this inspiration... read full description below. Life is a journey. Spiritual evolution is a spiral. 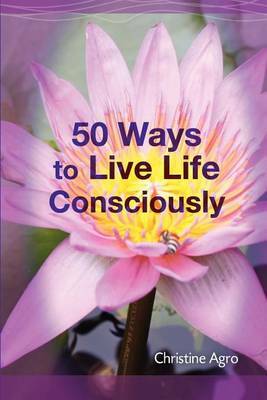 Living a conscious life puts you in the driver's seat of your own magnificently spiraling journey. Christine Agro We've been asleep at the wheel of our lives and the time is now to wake-up and start steering! In this inspirational book, metaphysical expert Christine Agro shares 8 simple yet powerful tools, life changing insight into why we are here and how our lives work, as well as 42 concepts that encourage and support conscious living. Have you ever wondered why certain relationships are so challenging, or just wished you could find greater balance and inner peace? Christine's information is simple and life changing. Once you read it, your view of life and the people you interact with will be positively changed forever.